Cake, balloons and its party time with these free printable cards! This Cake and Balloon printable birthday card will shine when you add some personal designs. You can even personalize it more by cutting out a picture of the celebrant and you then pasting it inside the front flap. This cutesy birthday card is perfect both for children and for adults who love to go 'aww' at their cards. And who knows; that red rose decoration may give you some ideas for your own birthday cakes! Print out this fun birthday card and give it to someone you care about today. There are large balloons, streamers, and confetti oh my! Nothing says happy birthday better than a card featuring the famous birthday cake tradition and surrounded by lots of colorful decorations. The fun design is backed with a soft blue color to showcase them all. Cake and Balloon is a free printable birthday card you are proud to include with that special birthday present. The single fold card has plenty of space inside for adding more birthday party inspired images. Select the card, follow the easy instructions to include your personal penned greeting and wishes, and print your card at home. Cake and Balloon is a fun traditional card appropriate for any age or gender. The large balloons, the curly streamers, and flying confetti are all around the birthday cake centerpiece. Plus, a pale soft blue background does not distract the viewer from the main attraction. 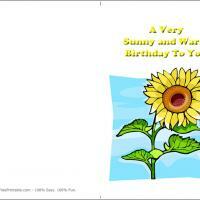 This single-fold and free printable card is only one of the many print at home birthday cards we offer. They are all quality designs and can be personalized to showcase your receiver's personality. Choose this card and follow the easy steps and you will have a customized birthday card in no time at all. The birthday guest will be amused to see your efforts just for them.